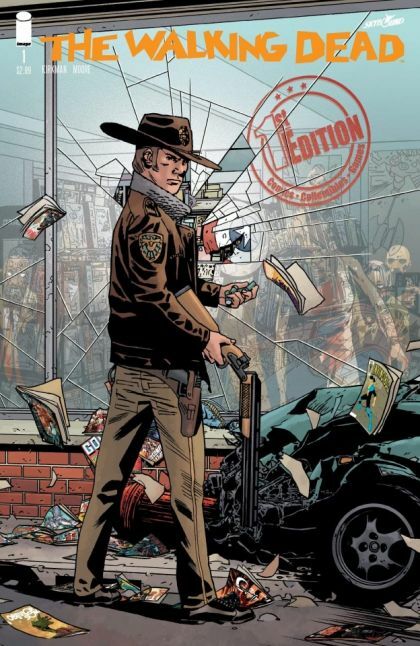 THE WALKING DEAD #1 15th ANNIVERSARY VARIANT features a brand new cover by Adlard showcasing walkers invading comic book shops across the globe to celebrate THE WALKING DEAD DAY. Rick Grimes, Sheriff of a small town in Kentucky awakes in a hospital. Comatose after being shot while on duty, Rick finds the world abandoned of all things living and is faced with walking undead, who attack him on sight. He returns home to find his family, son Carl and wife Lori, gone. He meets his new neighbor, who points him towards Atlanta. After retrieving supplies from the abandoned Police Station, Rick sets off to Atlanta to search for his family.